YOU’VE HEARD OF ‘a murder of crows’, a ‘volery of birds’, a ‘brood of chickens’. The term for the groupings of Ravens is less fixed. Ravens were/are often seen gathering about The Tower of London, and in meaner times, The Tower was a Royal place of execution (Anne Boleyn, et al) . AN UNKINDNESS OF RAVENS is what a grouping of them was called when a Royal was awaiting death–as though their presence was a foreboding, a cruel anticipating, a sign of ill will. A CONSTABLE OF RAVENS is what their grouping was called when The Tower was no longer sinister, but rather a symbol of The Monarchy itself. Their presence in such times meant they were keeping guard over the Royal Family. Ravens were a constance, a watchful presence–a constable. A CONSPIRACY OF RAVENS is another label for their gatherings, stemming from their ganging together whenever there’s carrion or bodily remains to be picked apart and eaten. Ravens don’t allow other than their own to share in the find. 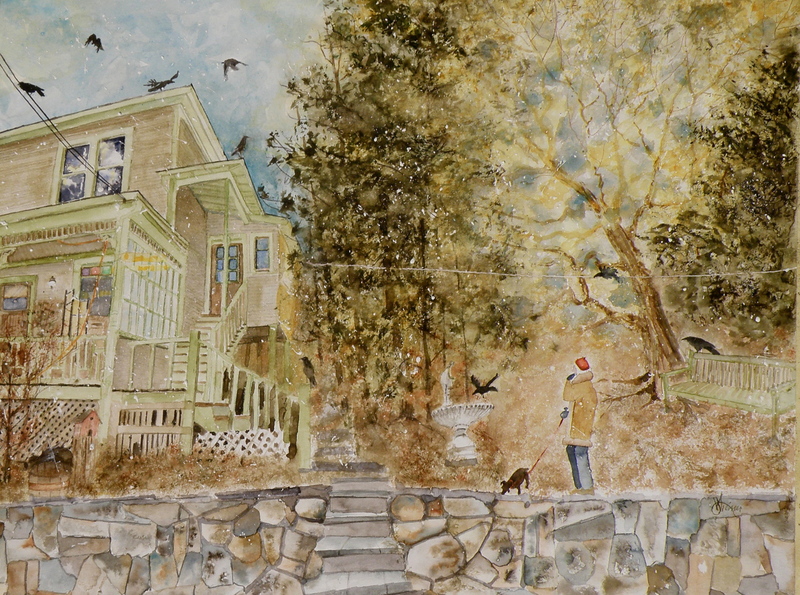 A WOMAN IN OUR TOWN THUMBS HER NOSE AT by-laws and ritualistically feeds Ravens all through the Winter months by pouring out cat kibble in several of her collection of decorative cement-cast bird baths around the yard of her time-worn and historic home. THE INTENTION of this rather busy piece of work is simply to allow the viewer entry into Joan’s world. Sometimes our hearts want to be filled–if not by another’s affections, then by the things we’ve grown fond of–and sometimes, not just filled, but rather overflowing with so much that we’ve come to take heart in, that its accumulated presence brings with it a comfort. A CONSTABLE OF RAVENS watches over and protects and guards the fading beauty of Seasons gone by, loves had and interred, and a lasting, loving sanctuary of the heart–as yet another Autumn invites one inside to sit by the fire and grow warm, and remember. I feel quite at home gazing into Joan’s yard through your watercolors. Thanks for a lovely intro. ….everyone visiting you, Janette, gets all that and more–how kind.